Ocean basins can be described as saucer-like depressions of the seabed. They vary in size from relatively minor features of the continental margin to vast structural divisions of the deep ocean. The largest ocean basins are 3 to 5 kilometers (2 to 3 miles) deep and stretch from the outer margins of the continents to the mid-ocean ridges. Ocean basins cover approximately 71 percent of Earth's surface or about 361 million square kilometers (140 million square miles). Their average depth is 5,000 meters (16,000 feet), and the total volume is about 1.35 billion cubic kilometers (322 million cubic miles). There are five major subdivisions of the world ocean: the Pacific Ocean, Atlantic Ocean, Indian Ocean, Southern Ocean, and Arctic Ocean. The Pacific, Atlantic, and Indian Oceans are conventional ocean basins and are bounded by the continental masses or by ocean ridges and currents; they merge below 40° South latitude in the Antarctic Circumpolar current, or west Wind Drift, at the Southern (or Antarctic) Ocean. In the North Polar Region, the nearly circular Arctic Ocean, almost landlocked except between Greenland and Europe, is considered the fifth ocean subdivision. The Pacific Ocean is bounded on the east by the North and South American continents; on the north by the Bering Strait; on the west by Asia, the Malay Archipelago, and Australia; and on the south by the Southern Ocean. In the Southeast it is arbitrarily divided from the Atlantic Ocean by the Drake Passage along 68° West longitude. It is by far the largest and deepest of the world's oceans and contains more than half of its free water. In area, this represents about 155 million square kilometers (59 million square miles). In comparison, the area of the continental United States, Hawaii, and Alaska is about 4 million square miles, sixteen times less in surface area. All the continents could fit into the Pacific basin. The Pacific is the oldest of the existing ocean basins, its oldest rocks having been dated at about 200 million years. The major features of the basin have been shaped by the phenomena associated with plate tectonics . The coastal shelf, which extends to depths of about 180 meters (600 feet), is narrow along North and South America, but is relatively wide along Asia and Australia. The Atlantic Ocean is the second largest of Earth's five oceans, the most heavily traveled, and the most intensely studied, principally because of its importance in ship traffic between Europe and North America. This ocean's name is derived from Atlas, one of the Titans of Greek mythology. The Atlantic Ocean occupies about 20 percent of Earth's surface, representing approximately 75 million square kilometers (29 million square miles). This includes its marginal seas: the Baltic Sea, Black Sea, Caribbean Sea, Davis Strait, Denmark Strait, part of the Drake Passage, Gulf of Mexico, Mediterranean Sea, North Sea, Norwegian Sea, and almost all of the Scotia Sea. The Atlantic is divided into two nominal sections: the part north of the equator is called the North Atlantic; the part south of the equator, the South Atlantic. The South Atlantic is arbitrarily separated from the Indian Ocean on the east by the 20° East meridian and from the Pacific on the west along the line of shallowest depth between Cape Horn and the Antarctic Peninsula. The ocean is essentially an S-shaped north-south channel, extending from the Arctic Ocean in the north to the Southern Ocean in the south, and situated between the eastern coast of the American continents and the western coasts of Europe and Africa. 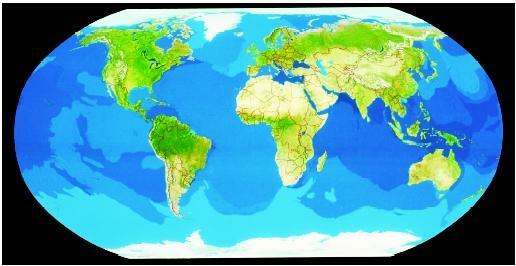 The world ocean with five major subdivisions covers nearly three-fourths of Earth's surface. From left to right are the easily recognizable eastern Pacific, Atlantic, Indian, and western Pacific Oceans, whereas the Arctic Ocean (top) and Antarctic (Southern) Ocean (bottom) are less apparent. The Atlantic Ocean has an average depth of 3,926 meters (12,881 feet). At its deepest point, in the Milwaukee Deep in the Puerto Rico Trench, the bottom is 8,605 meters (28,231 feet) below the surface. The Atlantic began to form during the Jurassic period, about 150 million years ago, when a rift opened up in the supercontinent of Gondwana, resulting in the separation of South America and Africa. * The separation continues today at a rate of approximately 2.5 centimeters (approximately 1 inch) a year along the Mid-Atlantic Ridge. Along the American, African, and European coasts are the continental shelves of the Atlantic basin. These are areas of debris washed from the continents. Submarine ridges and rises extend roughly east-west between the continental shelves and the Mid-Atlantic Ridge, dividing the eastern and western ocean floors into a series of basins, also known as abyssal plains. The three subbasins on the American side of the Mid-Atlantic Ridge are more than 5,000 meters (16,400 feet) deep: the North American basin, the Brazil basin, and the Argentina basin. The European-African side is marked by several basins that are smaller but just as deep: the Iberia, Canaries, Cape Verde, Sierra Leone, Guinea, Angola, Cape, and Agulhas basins. The break in the ridge at the equator, called the Romanche furrow, is important because it gives the deep ocean water a gap to flow through, which influences the currents and temperature of the Atlantic Ocean. The Indian Ocean is the third largest of the five oceans. It is bounded on the west by Africa, on the north by Asia, on the east by Australia and the Australasian islands, and on the south by the Southern Ocean. No natural boundary separates the Indian Ocean from the Atlantic Ocean, but a line about 4,020 kilometers (2,500 miles) long, connecting Cape Agulhas at the southern end of Africa with Antarctica, is generally considered to be the boundary. It has a total area of 68 million square kilometers (26 million square miles), which includes its marginal seas: Adaman Sea, Arabian Sea, Bay of Bengal, Great Australian Bight, Gulf of Aden, Gulf of Oman, Mozambique Channel, Persian Gulf, Red Sea, and the Strait of Malacca. The average depth of the basin is about 4,210 meters (13,800 feet), although the Java Trench reaches a depth of over 7,258 meters (23,812 feet). The Indian basin also is divided in half by the Mid-Indian Ocean Ridge. A decision by the International Hydrographic Organization in the spring of 2000 delimited a fifth world ocean, the Southern Ocean. Although not a true ocean basin, it extends from the coast of Antarctica north to 60° South latitude, which coincides with the Antarctic Treaty Limit. The Southern Ocean is now the fourth largest of the world's five oceans. The Southern Ocean has the unique distinction of being a large circumpolar body of water totally encircling the continent of Antarctica. Its area is 20 million square kilometers (7 million square miles) and includes the Amundsen Sea, Bellingshausen Sea, part of the Drake Passage, Ross Sea, a small part of the Scotia Sea, and Weddell Sea. The smallest of Earth's five ocean basins is the Arctic. The Arctic Ocean extends south from the North Pole to the shores of Europe, Asia, and North America. The surface waters of the Arctic Ocean mingle with those of the Pacific Ocean through the Bering Strait, by way of a narrow and shallow channel, which has a depth of about 55 meters (180 feet). More importantly, the Arctic waters mix with those of the Atlantic Ocean across a system of submarine sills (shallow ridges) that reach from Scotland to Greenland and from Greenland to Baffin Island at depths of about 500 to 700 meters (1,640 to 2,300 feet). The total surface area of the Arctic Ocean—including its major subdivisions, the North Polar Sea (the main portion), the Norwegian Sea, the North Sea, and the Barents Sea—is about 14 million square kilometers (5.4 million square miles). Approximately one-third of the Arctic Ocean is underlain by continental shelf, which includes a broad shelf north of Eurasia and the narrower shelves of North America and Greenland. Seaward of the continental shelves lies the Arctic Basin proper, which is subdivided into a set of three parallel ridges and four basins (also known as deeps). These features have been discovered and explored only since the late 1940s. The Lomonosov Ridge, the major ridge, cuts the North Polar Sea almost in half, extending as a submarine bridge 1,700 kilometers (1,060 miles) from Siberia to the northwestern tip of Greenland. Parallel to it are two shorter ridges: the Alpha Ridge on the North American side, defining the Canada and Makarov basins, and the mid-ocean ridge on the Eurasian side, defining the Nansen and Fram basins. The average depth of the Arctic Ocean is only about 1,500 meters (4,900 feet) because of the vast shallow expanses on the continental shelves. The deepest point in the Arctic Ocean is 5,450 meters (17,880 feet). Unlike the other oceans, the Arctic Ocean is ice-covered. At lower latitudes, the ice melts during the summer months. At polar latitudes, however, the ice cover is permanent. Another distinctive feature of the Arctic Ocean is the presence of islands composed of ice. These ice islands move, as does much of the ice cover, in the currents that exist in the underlying ocean water. Scientists have used the islands as research bases to study the arctic ice movements and other aspects of the far North. SEE ALSO Coastal Ocean ; Marginal Seas ; Ocean Currents ; Ocean-Floor Bathymetry ; Oceans, Polar ; Oceans, Tropical . Lebow, Ruth, and Tom S. Garrison. Oceanus: the Marine Environment. Belmont, CA: Wadsworth Publishing, 1989. Earth's Oceans: An Introduction. EnchantedLearning. <http://www.enchantedlearning.com/subjects/ocean/> . Physiography of the Ocean Basins. Okanagan University College. <http://www.geog.ouc.bc.ca/physgeog/contents/10p.html> . The World Factbook 2002. U.S. Central Intelligence Agency. <http://www.cia.gov/cia/publications/factbook/index.html> . * See "Volcanoes, Submarine" for the general location of the "Ring of Fire."